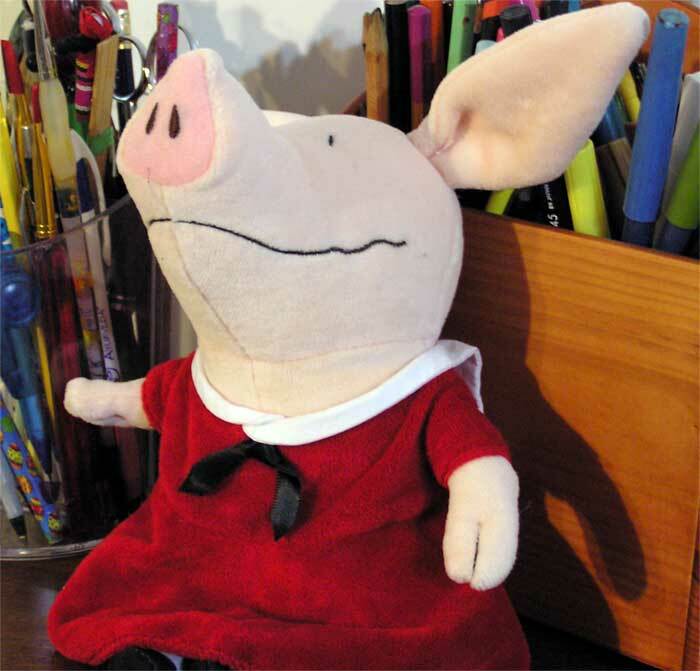 If you have kids, you probably recognize Olivia, the book character on the picture below. And if you have kids and don’t know who Olivia is, you should run to the bookstore and get some of Ian Falconer’s books because they are incredibly creative and fun. My daughter and I still enjoy reading them, even though we have read them a million times over the years and pretty much know them by heart. Oh, even if you don’t have kids, you should check them out. They will inspire you and make you laugh! This is Olivia. She is good at lots of things. When I saw this Olivia doll at the bookstore I simply couldn’t resist buying it because just looking at her makes me smile and feel good about myself. Yes, Olivia is good at lots of things and has no problem testing and trying new ones, even if just once, like the Pollock style painting she created on one of her home walls after a visit to the Museum of Modern Art in New York City! Olivia is also a dreamer and her great imagination takes her to great adventures where she is the main heroine. She is a famous ballerina, opera singer, tightrope walker, lion tamer, band leader, storyteller… with a very unique sense of fashion and style. Olivia’s drum beats to her own rhythm. She is unique, original, and very proud to be truly herself. So grab whatever brings you joy—your favorite painting, a souvenir from a nature walk, a cartoon, a friendship token, a childhood toy, or a doll like me—and place it in your studio where you can see it while you work. Let it remind you why and how you became an artist in the first place. Let it uplift your spirit when you need it and bring inspiration when you muse takes a vacation. Let it provide you with the smiles that you require on a daily basis so you don’t take yourself too seriously. Hopefully it will prod your creativity in the right direction and refresh your sense of purpose, especially when doubts start creeping in. Let it help you remember that, like Olivia, you are [you name here] and you are good at lots of things!